The park is situated along the 5800 block of N Avondale Ave, towards the north end of Norwood Park. Google map of the site – the DFA opened in October, 2012, so it’s not captured in Google Maps yet! Avondale, north of Bryn Mawr Ave.
Street parking is available along Avondale. Bigger than the smallest, but smaller than the biggest. We don’t have any quantitative measures yet. Asphalt surface with large pea-gravel areas. The pea-gravel areas are below the grade of the asphalt surface. The external pea gravel barrier, however, is simply 2×8″ lumber placed along the chainlink fencing. 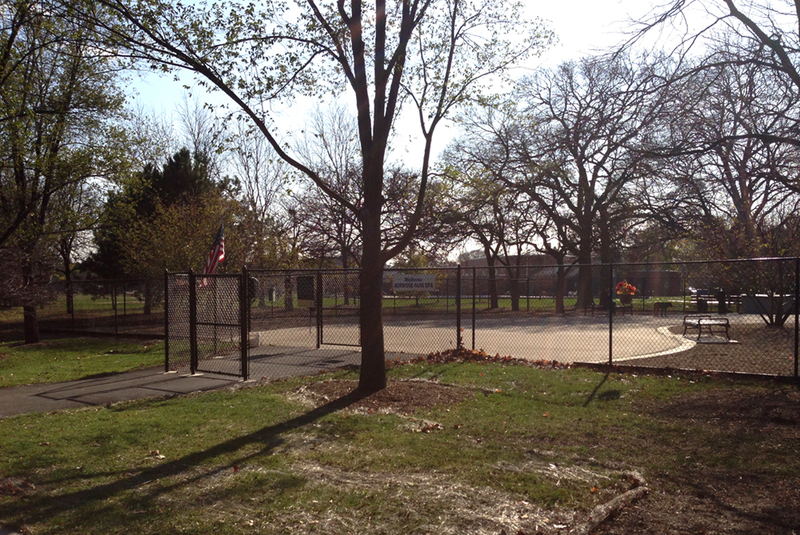 This easily accessible park is situated among the trees at the northeast end of Norwood Park. It’s a huge improvement over the previous ‘converted hockey rink’ DFA at Norwood Park! The responsibility to obtain and maintain a dog-friendly area falls to the users and the local DFA Association (in this case, the Norwood Park Dog Association, or NPDA). The Association is responsible for the cost of supplies, cleanups, maintenance, and signage. We need the support of the community to make it work. Membership in the Norwood Park Dog Association (NPDA) is $20 per household per year. The membership year extends from August 1 – July 31. By joining, the member agrees to the by-laws of the NPDA. A copy of the By-laws is available upon written request (neal@norwoodparkdogs.com). 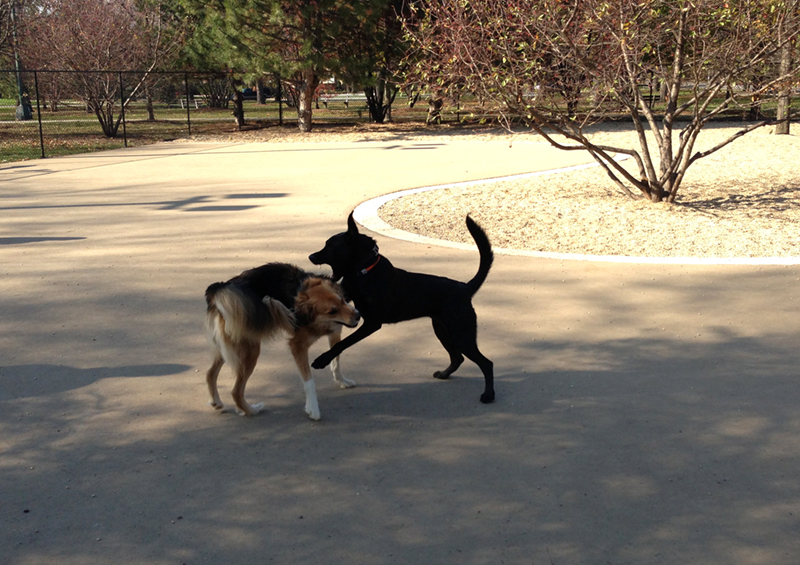 Dogs love the new Norwood Park DFA! A meeting was held Monday 4/30 at the Norwood Park Field house by Alderman Mary O’Connor and State Rep. Michael McAuliffe. The topic of discussion was the relocation of the Dog Friendly Area. About 100 were in attendance to hear that the DFA will be relocated to the NE end of Norwood Park along Avondale. It will be 10,500 sq. feet with 2 entrances at either end. It will also have benches, water, lights and no time restrictions (other than park hours). The surface will both asphalt and gravel. Other capital improvements including ADA upgrades and basketball court enhancements will also be done throughout the park. We were able to see the plans and construction should start in June and we were told it would take 6 weeks to complete. The NPDA will hopefully be able to work with the park district with the final plans. The current DFA area will remain open until the new area is ready. So please respect the neighbors and help us to keep the area clean. We thank everyone who turned out to support us. It is still going to take everyone’s efforts to keep this on the right track. emails, and weekly office visits regarding the Dog Friendly Area at Norwood Park. in the hopes of finding a compromise. and opinions on the DFA. work this out internally with officials from the Chicago Park District. as we continue to work toward a suitable resolution to the current situation. I love this dog park. Sadly, I had to put down one of my English Springer Spaniels (Charley) this week. The remaining dog, 11-year old Dude, discovered the park this week. We’ve been going to the park all week to distract The Dude from the loss of his buddy. This park is a real asset to the community. The dogs are friendly and placeful. Their people are conscientious, keeping everything clean and being good neighbors to all. I felt like a welcome member, as did The Dude. Neal, thank you so much for your work in producing their neighborhood center.